Checkout these tips on burning your candle safely and how to maintain it properly so you get the most enjoyment out of them. Never leave candles burning unattended. Let me repeat, NEVER LEAVE A CANDLE BURNING UNATTENDED. This is the single most important thing you can do to prevent a fire. According to 2012 statistics from the National Fire Protectin Association, 35% of fires started by candles are in the bedroom. A few logical reasons for this are, one, that people light candles to relax in the bedroom and fall asleep, or two, a candle is lit in the bedroom but then the person leaves to do things in the rest of the house. Place candles in a draft-free area. A candle flame that is in a draft will not burn all the fuel (wax) properly. This can cause your candle to burn unevenly, and possibley make it tunnel. Keep burning candles away from children and pets. Children are curious and a candle flame can be mesmerizing you do not want them to get burned. Both childern and pets can accidentally knock a candle over or off a table, creating a mess or possibly starting a fire. Never leave wick trimmings, matches, or any other material in the wax pool as these can create a fire hazard. Pieces of wick that have been cut off or other items that fall into the candle wax can re-ignite causing the candle flame to become much larger than is safe for a particular candle, even if it is in a container. In a glass container, the extra heat created from a flame that is too large could cause the glass to crack or shatter, allowing the liquid wax to go everywhere. Dispose of all packing materials or foreign matter before lighting a candle. Many candles have a paper band wrapped around them with the company logo and/or other information or a label applied directly to the wax. Make sure to remove any of these types of items from your candles before lighting them so they do not catch fire. Be careful to make sure that candle rings or other decoration items can not come in contact with the flame of the candle. Candles and flowers go together like, well, peanut butter and jelly, or Tom and Jerry (for those of you who are from the era of good cartoons). You always want to make sure that the area above your candle is clear of any flyaway decorations. As your candle burns down be sure that parts of the accent items will not become an issue later. Keep your burning candles away from any flammable objects. A candle on a windowsil might be ok, but what if someone opens the window, will the curtians blow into the candle flame? Be aware of what is around your candle and how a change in the surroundings could cause a problem. If a wick becomes too short, it will produce a flame that is too small for the candle to burn correctly. To fix this, extinguish the flame and carefully pour off the liquid wax. Relight the candle and allow it to burn for about one hour. If the flame is still too small repeat process until the flame is able to continue to burn the wax it has melted with a normal size flame. Direct sunlight and strong ultraviolet light can fade the color of your candle. Place your candle in an area that is not in direct sunlight. This is purely to keep the color of your candles looking nice and bright. A candle that is faded will still burn the same as if it were not. Prolonged exposure of candles to temperature below 40 degrees F. could cause the wax to crack. We have an informative video showing what happens when you put candles in the freezer to make them burn longer. Prolonged exposure of candles to temperatures above 80 degrees F. will cause the wax to soften which will warp tapers and cause candles to lose their original shape. Always place candle on a heat resistant holder. When the candle burns down to the bottom of the container there could be enough heat to damage the furniture on which the candle is sitting. Keep the flame from getting too close to the container. The heat from the flame could cause the container to crack. Handle burning container candles with care. The melted wax and flame can cause the containers to be too hot to handle. To be additionally safe, when the wax level is from 1/4 to 1/2 from the bottom of container, you should discontinue use and avoid the possibility of the container cracking. Votive candles are designed to liquefy across the top and must be burned in a container to avoid a mess. To maximize burning time always burn a votive and refills inside of containers approximately the same size of the candle. If the liquid wax flows too far away from the heat of the flame, it cannot be used as full and will be wasted. Remove any unused wick tabs and other debris from votive cup before placing new votive into cup. Keep the flame from getting too close to the container if the wick is not centered. An off center wick can be fixed by pulling the wick back toward the center while the candle is still warm. Adding a teaspoon of water to the bottom of your votive cups will make them easier to clean when the candle is finished burning. To maximize the burning of pillar candles allow enough burning time for melted wax to reach within 1/4 inch of the edge. Continuous short burning times will cause the candle to tunnel resulting in a drowned wick and wasted wax. If your candle starts to tunnel read this post on how to fix it. Caution, when liquid wax reaches the edge of the candle the wax at the edge becomes soft. Continuous burning at this point could result in liquid wax running down the side. If this happens the flame will continue to melt wax faster and continue the erosion of wax along the side of the candle in a straight line that makes the candle appear to have a crack. The resulting spilled wax runs out over the holder and onto furniture, tablecloths, and carpet causing mess. If someone responsible is not going to be around to care for a candle with liquid wax close to the edge, it is better to extinguish the candle for re-lighting at a later time. Make sure the candle holder is large enough to contain spilled - over liquid wax. Care for the flame height by trimming the wick, which will reduce flame size and thereby decrease the amount of heat which melts the wax. C. Large round wax pool close to edge of candle. When candle reaches stages b or c be careful that drafts are not causing the liquid wax to reach too close to the edge of the candle. If this is happening, turn candle around. If wax is still getting too close to edge: extinguish all 3 flames, let candle cool, and re-light at a later time. If you plan on burning a 3 wick candle inside of a hurricane read this helpful blog post to keep your candle burning great. 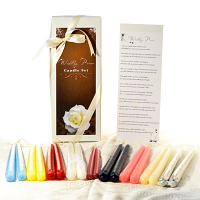 Our scented tapers, unscented taper candles along with our unscented colored pillars are designed to be a dripless. In order for these candles to perform as they are designed to do they have to be burned correctly. Donnot allow the flame to constantly burn closer to one side of the candle than the other. The two major factors that will cause our dripless tapers to drip are wind, and if the candle is not standing. Make sure that our tapers are burned in a low draft environment. This includes putting them near doorways, windows, air vents, fans, and high traffic areas where people are passing by them constantly. Also have our candles sitting straight in their holders. If a candle leans it forces the flame closer to one side of the candle than the other. This means the wax on that side will melt faster than it is designed to. As the "wall" on the high side of the candle melts it will drop below the wax pool causing it to over flow the edge and begin to drip. The wick is designed to trim itself. However, if flame dances up and down and you see dark soot coming from the flame, the wick is too long. Extinguish flame and trim wick and relight it. After a candle is extinguished the black part of wick is fragile. Sometimes when cleaning or moving, wick may get broken. This will affect the burning of the candle. When the wick is too short the liquid level may drown the flame. If this happens you will need to carefully pour off the liquid wax after you extinguish the flame. You may need to do this more than once until you get the proper size flame. We have a more detailed tutorial on how to fix a candle wick that is too short on our blog. Make sure to keep any debris out of candle, such as match parts or wick trimmings. As I stated right at the top, NEVER leave a candle burning unattended, it cannot be said enough. 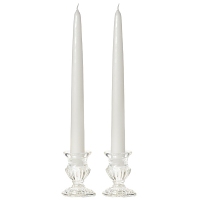 When it is time to put your candle out, use a candle snuffer for pillars and tapers. This will keep wax from spraying all over surrounding objects. To put out container candles simply put the lid on to cut off the supply of oxygen and watch the flame go out on its own. Be careful that clothing or hair does not come too close to flame. Placement of your candles at parties where guests dress up such as at Halloween is key. Make sure that no candles are set where they could catch a costume on fire. It is probably even a better idea to use LED candles on occasions like that. Remember to never lean too close over a burning candle. For the best and safest burning of your candle, keep wick trimmed to about 1/4 inch above the wax surface. Avoid placing candle in a draft. A draft will cause the flame to melt one side of candle more than the opposite side, which could result in melted wax running over the edge. A draft will also cause the flame to flicker which produces soot. When your candle is in a draft- free area check to see if the top part of the flame flickers and dances. When this does occur, you will probably also notice short bursts of soot. This is an indication that the wick is too long. These tips and guidelines are not meant to be an all-inclusive list. Please use common sense when burning any candle. We hope you enjoy your candle as much as we enjoyed making it for you.